On an abnormally hot day in early May, I walked into FuckJerry’s one-room Chinatown office. 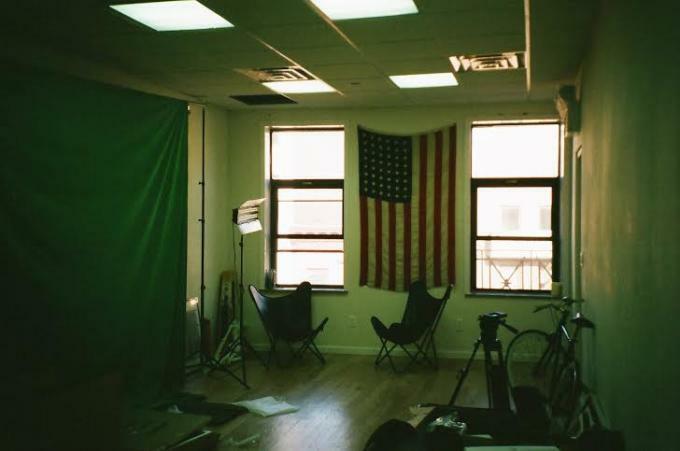 In an unsuspicious-looking building, the large fourth floor space serves as headquarters for the meme connoisseurs, and is fully decked out with an oversized American flag, a green screen, and an arcade-style basketball hoop. A beige cardigan laid spread out on a table in the center of the room with a Pax Vape strategically sticking out of its front pocket. Making the final touches, FuckJerry snapped a photo ready to be Instagrammed to @beigecardigan&apos;s 2.4 million followers for an upcoming giveaway. The man behind the curtain is 25-year-old Elliot Tebele; Tebele is single-handedly responsible for all of the content on @FuckJerry and pages like @KanyeDoingThings and @TheLightWeights, which have racked up more than 20 million combined followers. I also sat down with Elie Ballas, Tebele’s right-hand man and fellow FuckJerry partner who handles branding, partnerships, emails, and press requests, and Jerry Media CEO Mick Purzycki. The sounds of Drake’s Views played softly in the background as 10 or so employees searched the endless internet for viral meme content. We sat around the center table and FuckJerry talked to Complex about what it means to have one of the largest follower counts in the world. Complex: Memes are bigger than ever right now—how have you seen memes and internet culture around them change since starting FuckJerry? Elie Ballas: I mean Instagram is constantly growing, and for other uses as well, like now it’s curatorial. People are actually posting stuff that’s not theirs. Tumblr migrated to Instagram over the past couple years, so it’s interesting. FuckJerry: Yeah, the past year has been crazy. Memes just exploded in the past two years, not sure why. Mick Purzycki: I think it’s because they’re so easy to screenshot, and with longer form video, it’s starting to become a more robust distribution channel that we all cannibalize. The old distribution was through TV and stuff like that. Social networking used to be watching real TV programming, but there’s a lot of decent content for sure. How would you guys explain memes and their cultural significance to your parents? MP: If you think about Instagram in general and people’s attention spans, they’re super small and everything is so rapid fire. I think a meme is taking some comedic concept and just distilling it into the most rapid fire form of comedy. It’s very quick, one line, relatable, and really digestible. FJ: There’s a whole culture around it. People love the virality about it. Repurposing the same photo, which then becomes a competition to get yours to the masses. Did you think FuckJerry was going to be as big as it is? FJ: Definitely not. It started as a hobby I guess, about five years ago. I was just posting stuff back in the day and it wasn’t even funny. Things like sports and cars, but then I started the Instagram like, three years ago. Then I started posting funny stuff here and there and the engagement was so high that I just stuck with it. How exactly did you go from car uploads on IG to 20 million followers? FJ: I would say to just go with what&apos;s working. The old FuckJerry was filled with epic content, but I realized the humorous stuff was getting a ton more engagement and had a much greater chance of going viral. So I then slowly transitioned into what FuckJerry is today. What platform did you start on? How did you guys blow up? Was it over time? Or did you get a famous reblog? FJ: It really just happened over time, and I kind of just kept at it. I was also on the platform early, so I got that boost. EB: Branded content. We work with brands on sponsorships for the most part. Like what you were just doing with Pax and Beige Cardigan? FJ: Yeah, something like that. MP: There are two main pieces: There’s the influencer marketing, which is primarily just advertising through sponsored posts, and then there’s new business venture, which is basically taking over a brand&apos;s account, doing all of the content for them, and using the FuckJerry network to grow the account. A lot of creative studios just do content, but we do content and growth. Is the FuckJerry team the one who reaches out to other brands and accounts to work together or vice versa? FJ: It’s a mix of both. MP: We don’t have a sales department so it’s typically upselling people that are reaching out to him. FJ: For the most part it’s branded content, but we’re just getting into new endeavors, like “What Do You Meme?” We also have a book coming out and a show hopefully coming out. We have the clothing line as well at Fuckjerry.com and Jerrysworld.com, which leads to a bunch of merch that we have a team working on. “I Feel Like Pablo” spoofs and stuff like that. How do you tailor your humor and voice to fit the voice of brands during account takeovers without losing your brand identity? FJ: I&apos;m very selective when it comes to partnering with brands. If they aren&apos;t open to conforming to the FuckJerry voice, I typically would pass on the opportunity. At the end of the day, the more organic the post is. the better it is for both parties. What gave you the idea for the board game "What Do You Meme?" So Kickstarter kind of came up with the idea? FJ: Not really, they just mentioned how hot the game industry is right now and how explosive Kickstarter card games are. How did you guys choose the memes for the card game? FJ: We went through the FuckJerry feed for the most part, picked the ones that we thought would go well with the game. Then there was a lot of researching, reaching out to the owners of the memes to get rights, and signing documents. It was a lot of work. Why did you pick certain memes for the card game? FJ: They’re just the one’s I thought would work best. They’re all just expressions and weird faces, or, like, Pepe electrocuting himself. MP: When we were considering memes, we thought that the more recognizable the meme, the better. 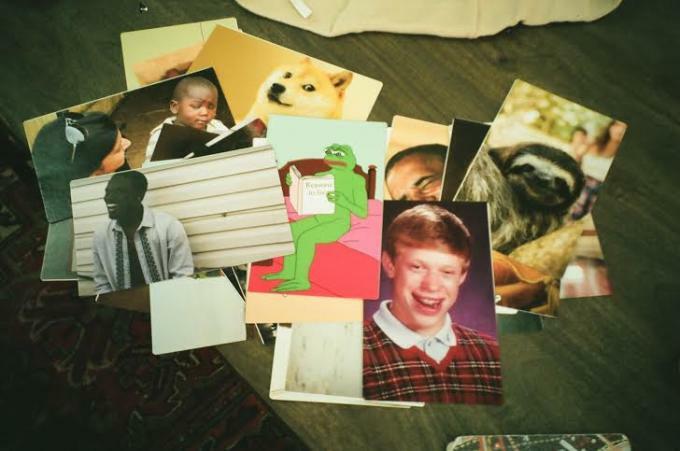 We definitely tried to choose memes that were kind of iconic images. FJ: You’ll be able to buy additional packs of 10 special cards when we sell it through the Kickstarter. Like, Pepe is a pack, there’s a Beige Cardigan pack, a sloth pack, a presidential pack. What’s the purpose of creating something physical that only really exists online? FJ: What I do every day is post memes on Instagram, so the idea was how to we make this tangible and physical to bring it to life. It’s like you’re playing Instagram, at least that’s what it feels like to me. Plus, it’s a good way to get the community understand it. What do you think of the hype cycle of a meme and staying fresh and relevant within the fast moving format? FJ: I love it, it keeps it refreshing. I think that&apos;s what makes memes so important in today&apos;s culture. How far is too far for a meme? FJ: I try not to go too far, just because it’s such a broad audience. We have moms and little kids following so I‘m definitely a little sensitive. If I could, I would get more raunchy. Do you think you would ever start a NSFW FuckJerry? FJ: Maybe. I have a few accounts. Does the whole team post to the FuckJerry account, or are you the only one? FJ: It’s just me. I’m on my phone a lot. Probably too much. What did you guys do before you worked at FuckJerry? EB: I worked at a tech agency. FJ: I was in the family wholesale electronics business. MP: I worked at Groupon and then founded a tech app company. FJ: I don’t know, maybe my mother? I hadn’t really thought about that. Where do you see FuckJerry in 10 years? FJ: I hope it still exists. If you could send any meme to Kanye, what would you send? Check out the Kickstarter for “What Do You Meme,” here.